Navigating the intricacies of financing a UK education can make even the most composed parents and students lose their cool. Luckily, Student Financing For Dummies helps take some of the pain out of the struggle and offers everything you need—in one place—to put a money management plan in place and finance a university education. Packed with accessible guidance from authors throughout the UK who work with students and policy experts, it provides unique, sound and detailed financial advice to help students and their families manage money while at school. Taking the guesswork out of the student-finance process and saving you countless hours of searching on the Internet, this friendly, plain-English guide helps you navigate applying for student finance, student loans and grants, makes sense of subject-specific income like the NHS, Teacher Training and Social Work and more. And after the money is in place, you'll discover how to establish a financial plan to make sure the money lasts—from term to term and through the entire time at uni. 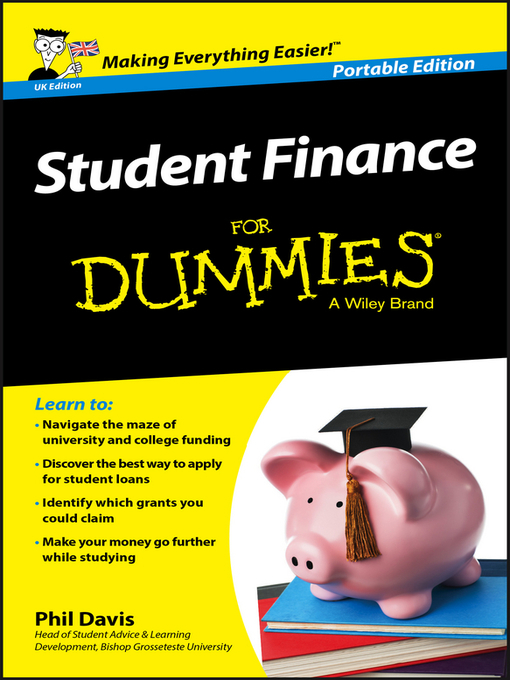 Take the worry out of financing your education and focus on your studies with the help of Student Finance For Dummies.